This was my first book in this series, but I must say that the authors did a fantastic job of placing me in Bridal Veil. By the time I finished the novel, I felt like I knew what it was to vacation there in the early 1900s. My favorite character in the book was Wesley. I thought he was the most developed character in the novel. He was a Christian without having that veneer of perfection and I just plain liked who he was. Callie was kind of a difficult character for me to like. She came across as a bit self-righteous and more controlling than I would have liked. While there was an explanation for her behavior, I’m not sure that it sufficed. I also felt that the novel lacked romantic tension. Callie and Wesley seemed to just fall in love because they were both there. That said, the writing was flawless and everything flowed. The characters were people of their times and I never felt like anything pulled me out of the novel. Spiritually, I liked that many people in the book sought God’s direction for their life and there seemed to be this overall theme of trust. The novel was well-written, but it just wasn’t my cup of tea. Ejected from her privileged life, Rosetta comes to Noble Island with a broken heart and shaken faith. She is enticed by hope in the arms of the dark and brooding Simon Hale, but people keep dying at Shadow Bay Hall, and Rosetta hears something in the walls. Simon Hale finds the reclusive Rosetta both beautiful and intriguing, but when she seeks out the truth behind Shadow Bay Hall’s unexplained happenings, he is torn between hope for the future and his need to protect a dangerous secret. With dark forces determined to keep truth at bay, Rosetta and Simon fight to uncover lies that imprison the island with fear. 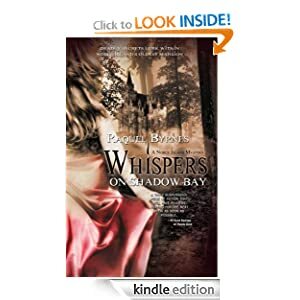 His wife’ death, tangled memories, a Romany feud; Rosetta must decide if she is strong enough to discover what’s behind The Whispers on Shadow Bay. I am a huge fan of gothic fiction, so this novel already had me from hello. There was the dark atmosphere, the creepy house, the mystery surrounding the wife, the child who was a little off, things that went bump in the night, characters who were just plain odd. I always like the way gothic novels reveal everything slowly and leads up to the big reveal. And yet, I really enjoyed how Ms. Byrnes was able to keep the gothic elements and still have Rosetta’s faith be at the center of the novel. I loved the emphasis on telling the truth, even when it hurts. It took me a minute to guess the bad guy because there were a lot of strange people on that island. I found it interesting to learn about gypsy culture and I thought that element made this story kind of unique. If there were any drawbacks, I would say that the hero and Rosetta fell in love a bit too quickly for me. I think I would have liked to see them interact more outside of the mystery. Otherwise, I recommend this novel! These next couple of weeks will be weeks of interviews on my blog. I was so excited to have the fantastic Patrick Carr on my blog this past Friday, and I have the lovely Melanie Dickerson this Friday, followed by the amazing Julie Lessman, and the wonderful Dani Pettrey. I love doing author interviews, but there are a lot of them out there. Thus, I try to approach my interviews differently than other bloggers. Some bloggers ask authors about their personal lives, or ask authors to share funny sides of themselves. And while I may ask a question or two like this, I try to ask questions from the point of view of a writer. Like why they made a choice to have this or that or how do they approach a new book. But a friend of mine recently suggested to me to ask those who read my blog if they might like to add a question from one of the authors that I interview. So, I put it to you. If I announced early enough who I had an interview with, would anyone be interested in supplying a question to that author? 1. Mr. Carr, what inspired you to write A Cast of Stones? I was reading my Bible and came across a verse that said “God is in the lot.” I started to wonder about that and my imagination kind of ran wild. What would it be like to have a world or church based on the ability of certain people to cast and read lots. That’s when the thought occurred to me that it would look similar to the medieval church before the Reformation, sort of mechanistic in its approach. After that, I tried to create interesting characters. 2. When writing a fantasy-like novel, what are some roadblocks that you come up against, if any? The biggest roadblock is staying consistent within the world you’ve created. The temptation is there to make up new rules as you go along whenever you get to a tricky point in the story. Readers are pretty unforgiving of that approach, but it does happen quite a bit. You can see hints of it even in the very best selling fantasy series. I had the luxury of being able to make minor edits to the first book even while I was working on the last one. That helped make the story very consistent throughout. 3. Errol is such a well rounded character, did anything (anyone) influence his creation? I’m like any other writer, I pull my characters from real life and Errol is an amalgam of a lot of people. But in addition to that, he represents the kind of person I’d like to be. Physically, he looks like my oldest son. I use my family’s likenesses quite often when I’m writing. 4. As far as secondary characters go, one minute Cruk was my favorite, then Martin, then Luis, and Liam’s role as a foil to Errol was almost comical. Did you have a favorite secondary character? I’d have to say Rokha. She’s a lot like my wife in some ways, strong, but very caring. Mary is a nurse now, but when I met her she was her school’s crew team and had all the muscles you’d expect on a warrior woman. Rokha acts as the caravan’s impromptu medic which is another similarity. 5. Can you tell us anything about The Hero’s Lot? It’s the second book in the “Staff and the Sword” trilogy. The middle books are sometimes a little slower in their pacing as the author gets ready for the big finish, but everyone who’s read “The Hero’s Lot” so far has told me it’s even better than the first. I will say that Errol discovers the truth of his parentage. It’s not what the reader would expect. Can a Canaanite harlot who has made her livelihood by looking desirable to men make a fitting wife for one of the leaders of Israel? Shockingly, the Bible’s answer is yes. Pearl in the Sand tells Rahab’s untold story. Rahab lives in a wall; her house is built into the defensive walls of the City of Jericho. Other walls surround her as well–walls of fear, rejection, and unworthiness. A woman with a wrecked past; a man of success, of faith…of pride. A marriage only God would conceive! Through the heartaches of a stormy relationship, Rahab and Salmone learn the true source of one another’s worth and find healing in God. I am not really a fan of Biblical fiction because the Bible is just the go to place for finding out about these people, but that said, A Pearl in the Sand had such great reviews it needed to be tried. And oh how I enjoyed it! I think Ms. Afshar did a fantastic job of keeping the story uniquely hers while also staying true to the Bible. I loved Rahab’s desire to know God and to please Him and it was a lesson that I can always keep with me. I thought Salmone’s personality really fit him as a man of his times and a man in love. I particularly love that the story didn’t stop when they got married. I like how marriage is just the beginning and the illustration that is given to describe Rahab at the end is perfect. Highly Recommended! homeland, Ayiti throws herself into her studies and becomes a successful doctor. Ayiti knows she has a God-given call on her life to return and help. the very cultural beliefs that she prides herself in. Jesus? Will Jude win Ayiti’s heart? What a book! I really enjoyed Ayiti and highly recommend it. First, though let me tell you what I loved about it. Ayiti is a Haitian-American doctor who feels like the Lord is leading her to go to Haiti to volunteer her services for a year. Yet, though she believes in Jesus she doesn’t know him and I really liked how the author was able to show the difference between believing and knowing Jesus. This novel also addresses the issue of trying to combine two religions…it simply doesn’t work. I learned a lot of about voodoo and how some people try to practice both Christianity and voodoo. I also loved the love interest. I liked that Jude had two strikes against him so-to speak and he overcame them. Jude. What a guy. At moments he was so intense and at other moments so sweet that it made him seem real. I loved his relationship with God, but when he was human he really just showed his age. One thing I appreciated about the romance in this novel was that the physical attraction didn’t carry the relationship. Watching the relationship develop into friendship was a joy to read. Furthermore, after Ayiti got saved, she and Jude didn’t just get married. There was time for her to develop as a believer which I think a lot of books don’t allow for. The downside to this book was probably all the endearments that Jude and Ayiti called each other, maybe since I’ve never been in their shoes I don’t get it, but it was a bit much. I will say there is some adult content that is not usually in most Christian novels, but nothing out of order. I really enjoyed this book. It was so nice to read something that I don’t usually read and enjoy it. Recommended! And for the record, my review is long because the book is 1000 pages! I felt like I went to Haiti and back! her stepmother’s jealousy, and believes escape is her only chance to be happy. Seven, they find help—but also find their feelings for each other have grown. must also protect their hearts. I think we can all agree that last year was an ode to Snow White, so I will readily admit that I was tired of the famous pale lady. But, from the first few pages I was immediately drawn into the novel which was both familiar and different. I really liked Gabe and the fact that he was not Sophie’s betrothed. I understand and appreciated his motivation to rescue Sophie. And Sophie was a great heroine. She was not a passive Snow White who waited for life to happen. Also, if you’ve read The Healer’s Apprentice, then you will understand how nice it was to see how Rose and Wilhelm again and to meet the new members of their family. Spiritiually, I love how Sophie stayed in the scriptures and followed them regardless of her situation. I so enjoyed this book. I couldn’t put it down and I highly recommend it!